Unbeknownst to us, at the end of 1943, the Allied troops were ready to invade Italy. This event must have been known to the German High Command and it appeared to be the reason for our move due south. The purpose of our move will become clearer later on. Before moving and relocating the entire battery, we received three days of furlough. I packed my belongings and bid adieu to the barracks and trenches. I could see my parent's unhappiness over the news of my transfer. They saw their son leaving home to an unknown destination, while the war showed signs of distress. However, my enthusiasm about the new adventure helped ease their apprehension. I promised that I would write often. It turned out to be an empty promise. Mail does not function well when you are losing the war. Instead of enjoying my three days at home, I ended up spending nearly half of every night in the bomb shelter. I must admit, sitting in the reinforced basement shelter during a bombing raid was worse then squatting in a dug-out trench. When the three-day pass expired, I was actually relieved, saddened only by the thought of how much my family would have to endure. They could only look forward to more nights like the last three. Hitler had promised that a secret weapon would soon turn the war victorious for us and would end the air raids. It became obvious that my mother now had enough of the war and she questioned why it ever started. I said goodbye to my parents and my sister, not knowing when we would see each other again. Only one month earlier I had celebrated my 16th birthday. Joachim, a school friend from the neighborhood, was in my class and we would be traveling together. Joachim lived only two blocks from our home but we had never really been close friends. As it turned out, we would become very good friends. All boys of our high school class had to report for assembly at the Berlin-Lehrter railroad station, and we did it with nervous anticipation. Winter had set in a little early and light snow fell as we assembled at the station. So far, the only word about our trip was that we were going south. The train assembly consisted mainly of a group of flat bed cars loaded with all of the equipment, like guns, radar, optics, kitchen, ammunition, Quonset hut and barracks kits. Two boxcars with sliding doors became our new mobile homes, supposedly for the next two days. Two NCOs assigned to each car were in charge of us helpers. Straw covered half of the car flooring, and each of us received two blankets. Between the blankets and our winter overcoat, we had enough to survive the train ride. Once on the way, our NCO revealed our destination. The German High Command had ordered our battery to make our guns operational as soon as possible on some farmland south of the city Graz, Germany, between the cities of Maribor in Slovenia and Zagrep in Croatia. We estimated it to be about 550 miles of travel. We also had the good news that our two teachers were not on the train, and the bad news that they eventually would join us. I hoped that they could not find us. Our train moved along quite well with virtually no stopping until lunchtime. The train stopped at a small station to serve us a hot meal and to allow us to use the restroom. They also handed us our evening and breakfast rations. The stay was of short duration and we were on our way again. After darkness set in, we closed the doors. By the light of some flashlights, we munched on our bread and sausage. We washed the bread down with some cold tea. After that, we got comfortable and one of us classmates read aloud an episode of an adventure story written by Karl May. It is strange how a bunch of 16-year-old boys could be quiet and listen to written words. Reading aloud Karl May's adventure stories became a steady evening entertainment for us later. Most of the time, many would fall asleep before completion of the chapter, asking others the next morning what happened. Karl May wrote approximately 42 adventure books, quite often in first person. He was Old Shatterhand in most stories about American Indians, cowboys and bad guys. I found out later that he had never set foot on American soil. I devoured a minimum of 22 volumes ranging from the famous Apache Chief Winnetoo to Hatchie Alef Omar Ben Hatchie Abul Abas Ibn Hatchie Abul Agossera from Arabia. (I spelled Hatchie's name as I remembered it). Winnetoo was such an important Indian chief that he wrote three volumes about his adventures, such as meeting and living with this world famous Apache leader. His writing was so believable that Winnetoo just had to be the greatest Apache chief on American soil. Little did we know about the real Indian leaders in America and less about the real Hatchie in Arabia. During the night, we passed through the Austrian city of Vienna. By dawn, we had arrived at our destination. Unquestionably, moving a train so far and so fast meant we had high priority. Recent rain had soaked the fields destined to receive our guns. It appeared to be a hopeless situation, with some of the guns sliding down any minor embankment. Somehow the soldiers, who appeared to be like a German Corps of Engineers, overcame the impediment. Within three days, with the help of several trucks, our four guns formed a perfect square. The optics and radar equipment ended up in their strategic location, with the power and communication cables strung and secured to wooden poles. We had to survive in tents for a week before we could occupy our barracks. Our manpower had a surprise personnel addition and reduction. Six Russian war prisoners were there to help us with physical labor. We did not know if they had volunteered for this assignment or if they had no choice. We received orders not to fraternize with the Russian POWs. Only assigned personnel were allowed to communicate with them. The other surprise about our manpower was the loss of about 20 soldiers, replaced by us helpers. We heard that most of the replaced soldiers ended up at the Russian Front. It became clear that we helpers were no standbys anymore. We were now ready to show what we could do. The only soldiers remaining were NCOs, ammunition handlers, cooks and a few orderly room personnel. Our living quarters were assembled using pre-fabricated barracks sections, some even with built-in window panes. Our Hauptleutnant, promoted to captain, occupied one small hut, right next to the orderly room barracks. Our six NCOs had one building, while the few other regular soldiers had their barracks, and the Russian POWs lived in their own hut. The helpers' quarters was one large barracks with 12 double bunk-beds, 2 large tables and 24 chairs. Again, each of us had a little portable pantry to store our bread, sausage, cheeses and marmalade. A very temperamental potbelly stove in the center of the room could heat the room close to 100 degrees F when fired up. With the outdoor temperature hanging around 15-20 degrees F and the stove in full blaze, it was often that by bedtime we used only sheets to cover us. By dawn however, we used both blankets and our overcoats to keep warm. We needed a maid to put some wood into the potbelly stove overnight, but we had no such luck. I had brought my crystal radio along. At my first chance I strung a wire as antenna. Amazingly, by poking around late in the evening with a wire on the crystal, I had good reception on my headset, bringing in distant stations in foreign languages with nice music. One short time, I heard Radio London broadcasting news in German. My crystal radio was highly sensitive and when I lost Radio London, I was unable to find it again. I thought it to be very interesting. After our anti-aircraft battery was set-up, we had to bring it into operational readiness. The next few days were very interesting and different. The optical instrument required computer calibration. The guns and our optics required coordination, to allow the guns to point in the direction the computer tells them. We had barely completed this operation when we had our first action. A spotter sighted a plane at high altitude and he identified it as an American plane, a P-38 Lightning. The P-38's estimated height was about 35,000 feet. The spotter called for Alert Status 1. We hurried to our posts and quickly focused on the plane. Within minutes, although our instruments still required final calibration, our guns fired. The plane appeared to make evasive maneuvers, it reduced elevation, and after we had fired about five to six rounds, it disappeared over the horizon. From what I observed, there was no chance that our shots ended up even close to the plane. Yet one hour later, our captain received word that we had helped to shoot down a German airplane, a Messerschmitt Me-110. The P-38 and the Me-110 look similar at great distances and at different angles. We really had no excuse but only mitigating circumstances. Rumor had it that our captain did not report our participation in firing at the Me-110 and that he conveniently forgot to do it later. The pilot of the Me-110 had not released identification flares, which would have indicated that it was a friendly plane. The signal for the day was two reds and one green flare. If he had followed procedure, we would have ceased fire. We heard that the pilot had ejected successfully. I have to admit that we were convinced that it was a P-38 from what we saw through the glasses. But shooting down a P-38 with 105-mm guns is as likely as killing a flying swallow by throwing boulders at it. Naturally, our plane identification instruction went into high gear. Besides German planes, we had to recognize P-51 Mustangs, B-24 Liberators, P-38 Lightnings, and Flying Fortresses, the famous B-17. Now that we did not have so many soldiers around, we helpers were stuck with our next job. 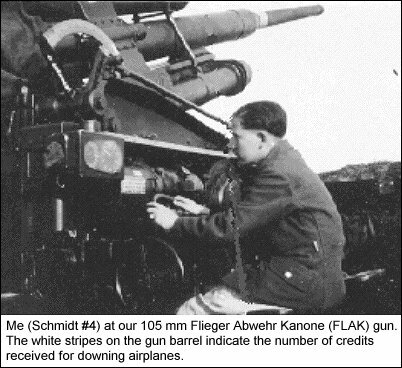 The four guns, the radar unit and the optical instrument required protection by surrounding each piece of equipment with a dirt barrier. The mound had to be high and thick enough to give us maximum protection. At the same time, it had to allow us to lower the guns to a horizontal position and our optics had to be able to see over it for calibration. We had no plans to fire the gun in that horizontal position. However, sometimes after firing a round, the empty cartridge would not eject. To dislodge the cartridge, poking it from the front end with a long pole was required. That effort necessitated lowering the barrel to the horizontal position. While dealing with gun firing abnormalities, I might as well mention another potential serious problem. If an activated round misfired, meaning the projectile did not leave the barrel, a dangerous situation existed. In this predicament, orders were that all personnel had to evacuate the gun emplacement for a minimum of 3 minutes. This time interval was supposed to be enough for the projectile to explode while inside the gun barrel and it would blow the barrel to bits. After the 3-minute delay, two soldiers had to enter the embankment and operate the release mechanisms on the gun to eject the round, and then catch the round. Can you imagine, a 75-pound cartridge, possibly activated, comes flying out of the back of the gun and you have to catch that thing. After that, he must carry the round to an embankment made for such a case. Such safe place required carrying the round at least 50 yards. During my service interval, this occurred four times. One time, the NCO asked the Russian POWs to catch the round, but their response was a panicky "no way" in Russian. An activated round is a hot potato. The timer in the projectile could be running and then would blow at the set time. If that occurs while the projectile is still in the hand of a soldier, you may guess what would be the result. Luckily, all our duds remained deactivated. Between shoveling dirt, we completed calibrating all our guns, radar and equipment. Now we had to prove not only that we calibrated the instrument correctly, but also we had to show that Hitler�s little helpers could perform the duties as expected. A target shooting exercise for our battery was scheduled. A target airplane would fly over our area. Our system was rigged so that the optics and the radar would track the target, but the guns would shoot at the mirror image. We passed the test, both by optics and by radar. We were now action-ready and just in time for our two teachers to arrive. Our school curriculum included four hours each per week of mathematics, physics, German, chemistry, and biology. One hour per week was set aside each for history, English and Latin. At that time, I could not imagine why I had to learn Latin. Sure enough, one of the teachers was Herr Lustig. I got along with him a little better since he had again left his bamboo stick in Berlin. Herr Lustig also taught Math and Physics, my strong subjects, besides teaching Latin and history. The first school day after weeks of hiatus started on a Monday at 8 a.m. and by 10 a.m. the alarm bells ordered us to man our anti-aircraft stations. Good timing. Incoming reports from headquarters alerted us of approaching planes from the south. The dispatch gave a distance of approximately 100-km and we searched with our optics. Wanting to see anything through the misty sky, we finally made out a blob of what looked like a group of planes. Once focused, we followed their flight path diligently. Soon we could identify them. Twelve B-17 Flying Fortresses were coming on a straight pass toward us. When our captain asked for the countdown of the distance, excitement mounted. Every few seconds one helper would call out the distance, "700," "650," "600," "550." We knew that the distance callout of 420 was close enough to be in firing range. The guns were pointing toward the planes with the first cartridge in the gun's cradle ready. By the time one group flew past 90 degrees of their 180 degree half-circle, the next group of twelve B-17s was coming near enough to become a target. We would pick them up, follow them, the distance count down proceeded again and sure enough, by "450" they too would turn. This procedure would occur with five more groups of twelve planes. Without a doubt, this kept us busy, but we had no chance to shoot while they stayed out of range. We knew now those 72 bombers were on their way to bomb a target and that there was nothing we could do to stop them. Once they were all gone, we assumed they would soon return. We watched the northern horizon for returning planes. Shortly, we heard the report that they are heading south, meaning they would have to come right over us. If they were short of fuel, they might have to go the shortest route, and fly right over our battery. The B-17s probably considered the location of our battery to be quite a nuisance. On their return trip, they did exactly what one could have guessed, they made a nice wide circle around us again. The only positive thing about this activity was the training we received for tracking planes. Also, when the planes made their evasive circle and reached the 90-degree point, we had a full side view of the planes, giving us a chance to admire the various girly paintings on the sides of some planes. This exercise of futility continued on and off, sometimes two or three days apart, for weeks, with the same scenario, circumvent our battery. One time, we were in the process of securing our battery after the usual alert, and we heard engine noises. Surprise, surprise, a lame duck of a B-17 with two engines out, one of them smoking, flew right across our position at approximately 10,000 feet. But by the time we got ready, it was almost gone and our guns did not get a round off. However, a few miles from our location, a sister battery of 88-mm anti-aircraft guns, was able to let a few rounds go. Later we heard that the crew jumped and that a Croatian underground partisan group took them into protective custody. I remember one other occasion, when three B-17s headed in our direction. Since we had received advanced notice, we were ready. It was a clear day, and they came into view at an altitude of approximately 30,000 feet. It appeared that they were on a return trip from an attack on Vienna. They knew the location of our battery position and when they came within firing range, they initiated severe evasive maneuvers. They spread out a little, and flew in a zigzag fashion. One moment we saw three planes in our glasses, next we saw only one with one of them going left, and then after a while, right. When all three were doing this maneuver, we got confused. In order not to confuse the computer however, we tried to keep a steady motion, but without much success. Every time we adjusted a little too fast, we could hear the gears in the computer whirl excessively. When that happened, the guns received very erratic signals, and I mean disastrously wrong signals. The gun operators would try to follow these erratic signals, with all four guns pointing to nowhere and everywhere. One would think that they would stop firing, but no way. Every 5-6 seconds they blasted away, not in a salvo, but they fired whenever they were ready. Then one of them had a stuck cartridge, and they had to lower the gun, to allow one soldier to push the cartridge out from the front. Laurel and Hardy could not have created a more comical situation. Once we had our optics under control again, the computer quieted down, and the guns started to settle down, continuously firing. The guns had fired a record of 64 rounds for one engagement. We had no evidence of hitting any of the planes, but we somehow received credit for downing six planes. I have no idea how they came up with those figures. The next day they painted six white stripes on each gun barrel. But to avoid a repetition of such a fiasco, we received detailed instructions on how to handle the next capricious B-17s. 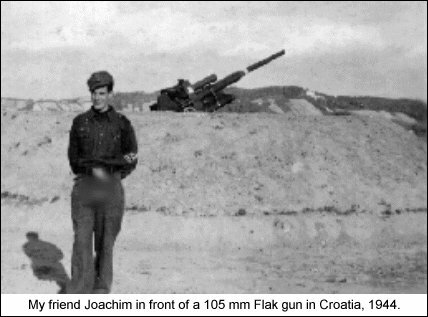 Relatively little contact between us helpers and the Croatian population occurred during the time that our battery occupied some of their farmland. Some of us helpers changed that on Easter Sunday, 1944. Hard-boiled eggs were not on our canteen menu and Easter Sunday required some eggs. We decided to visit the village community and try to purchase some eggs from the surrounding farmers. We figured that if we got enough eggs we could share them with the entire battery. About eight of us helpers invaded the village, in-groups of two, not knowing that the Croatian people had a special Easter social observance. If someone entered their domicile on Easter Sunday, they could not allow the visitor to leave without serving food and drink. When we asked to purchase eggs, they invited us first to the cellar for a taste of their fine wine. I remember the wine flowed just like light oil and slithered down our throat. I might have been a novice when it came to wine tasting, but that wine was outstandingly drinkable. Then we received a slice of their homemade bread covered with sausages or cheese. Only then, would they surrender some eggs, without accepting payment. That was a symbolic gesture of some remarkable people, who had foreign soldiers in their backyard, and treated us cordially and friendly, like neighbors. By the time we visited three farmers, we had enough eggs, as much as we could carry, and definitely we had drank enough wine. We returned to our barracks singing drinking songs. All but two of our fellow helpers returned more or less inebriated, all with a few eggs. A couple hours later, our last two showed up. They were very noisy and very drunk. One of them, trying to stand straight said, "Look I have some eggs." With that, he reached in his coat pocket. His hand came out dripping with raw egg stuff. We had to put him to bed, and when he got noisier, we restrained him. Our sergeant had heard the commotion and came into our room. He assessed the situation, and then shook his head and left after telling us, "Just make sure everybody shows up tomorrow morning for roll call." The next morning, we presented our cook with about 40 eggs, maybe not quite enough for everybody, but he was very appreciative. As time went on, with many alerts interrupting our schooling, our teachers had a hard time getting us together for classes. Our captain gave them room to maneuver, however, and so we got some casual education. Naturally, Herr Lustig, the Latin teacher fanatic, had to have his days, I believe just to make me miserable. He would give us an assignment to read and to remember a great number of Latin words. A week later, he threatened to give us a written test. I had no problem reading the words, with the remembering part I had a problem. Teacher Lustig finally got the best of me. He scheduled a Latin test for next Tuesday, only four days away. I knew that I must find a way to avoid Tuesday's class. Every waking hour required serious thought to find an excuse why I could not attend school. I knew that "not feeling well" would not work without having to go to the medic, and he would check me out and send me to class. I needed pain not easily determined with a phony ache. It was not until the day before the test that I had the foolproof solution. A few years ago, my sister had an appendectomy. I remembered her symptoms, such as pain in the lower right abdomen, and vomiting. That is the solution, I decided. Tuesday morning I reported to the sickroom. Oh, my pain. I could not stand straight. I held my lower abdomen and I grimaced convincingly. When I said that I had thrown up, the medic took my temperature. I had no fever. He made some "hmm" sound and said, "That is strange." He poked a little on both sides of the abdomen, and predictably, I only made noises when he poked on the right side. It seemed to work. He ordered me to see a military doctor in Maribor, a town in northern Slovenia, about 5 miles north of our battery. The nurse requisitioned a vehicle, and with some paperwork in my hand, I arrived at the doctor's infirmary. He too heard my story, I had it pat by now, and he examined me. After a similar "hmm," he did not want to take a chance of a wrong diagnosis, he suggested that I go to the military hospital in Graz, a city in southeastern Austria on the Mur river. Now, this was becoming a problem, more than I had planned. By now it was afternoon, and I had expected to be back at the battery already. With new papers in hand, I was driven to the railroad station, put on a train and was on my way to Graz. In Graz, a soldier picked me up at the station and drove me to the hospital. Clearly, I now had a problem and second thoughts about continuing the charade. My forwarding papers indicated my reported symptoms and I had no idea how could I tone down my symptoms without admitting my deceit. I felt trapped in my scheme. The doctor, an Army major in his 50s, appeared a little rough around the edges. He looked at me, poked, then walked away. I thought I heard a "hmm" on his way out. Five minutes later, two friendly female nurses took charge of me. They provided me with a hospital gown and took care of my uniform, after assigning me a bed in a large ward. The situation escalated now from a simple appendectomy to a civil war, when this Berliner, a Prussian, ended up in a large ward, next to a bunch of sick Bavarian soldiers. Replace in the last sentence, Berliner with New Yorker; Prussian with Yankee; and Bavarians with Southerners and you have a volatile situation. Many of the soldiers in my ward had some kind of goiter condition, which would make anybody disagreeable. During my first day, two guys tried to belittle my Prussian heritage, one guy threw a spittoon at me, and one threatened to use me as target for his flying bedpan. Maybe they got mad at me for knowing everything better, than they, those southern hicks. After that experience, I told myself, keep your big mouth shut if you do not want to get hurt. Besides, I received loving attention from the nurses since I was the youngest soldier ever to be under their wings. I almost forget my condition. The nurses informed me about an upcoming appendectomy, the next morning. Yes, the removal of my appendix appeared on the operation schedule. I asked myself: "Do I need an appendix, or would I be better off with out it?" I really did not have much of a choice. The date was July 12, 1944. A couple hours before my operation, the nurses made me swallow some pills. They said they were happy pills. Who can resist a nurse with happy pills? Once in the operating room, an injection into my spine was supposed to make my lower body anesthetized. They made me turn over on my side, and then, what appeared to be an intern, tried unsuccessfully to insert that anesthetizing needle into the proper spine area. I asked, "Having problems doc?" The major took over and finished it without any discomfort for me. After a while the major would ask me if I felt this. My lower body was anesthetized, but my mouth was still functioning well. "Felt what, doc?" I asked. He had made the incision already. I did feel a little strange around my upper belly, but no pain. Before I could really tell the doctor the story of my life, he closed me up. I had no idea if the doctor could tell that I had faked the illness. Since no one mentioned it, I felt a little relieved. All he told me was that I would have to stay in bed for nine days; not something to look forward to with all those funny sounding soldiers around me. They might have spoken German, but they sure could fool me. I had a hard time understanding the strange southern words they used. The days went by rather slowly and staying in bed all day became boring. On the second day, I got out of bed to use the bathroom. On the seventh day, I stood next to the bed for the rounds by the doctors. The major looked at me, looked at the chart, and then counted, "1,2 3,4 5,6,7." "I said 9 days", he continued and ordered me back to bed. Therefore, I remained in bed for one more round. Apparently, my recuperating period had not ended. The nurses informed me that I had to hang around the hospital for at least one more week before I could return to my unit. Since I was not restricted to the hospital I requested and received a pass, allowing me free movement within the city of Graz. During my entire stay in this city, the air raid sirens were silent giving me free time to hang around cafés and movies. Here I met a young lady, a few years older than me. She had long wavy red hair and some freckles crinkling around her nose when she smiled. Soon we met every afternoon giving me a wonderful experience. I had a genuine crush, maybe puppy love, but you could not have convinced me of that. At the end of my recovery period, sadly I had to report to my unit, taking loving memories with me. Nothing significant had changed at my battery during my prolonged class-cutting interval. Naturally, I had to tell my buddies everything that happened. One particular item, however, I kept secret, the fact that my appendix was never inflamed. Only my friend Joachim was privy to this secret. The American bombers appeared to have other urgent targets, since during my absence they came around only once. The appendectomy had a benefit, limiting my physical activity. No drill, no ditch digging, and no push-ups. Unfortunately, kitchen duty had no limitation. I learned quickly how many potatoes needed peeling to feed the personnel of one anti-aircraft battery. My light duty also included manning the spotter glasses during quiet periods. It really was relaxing duty. I would scan the horizon and the sky with the 32 power glasses. I told myself that I would not falsely identify the Me-110 for a P-38, but nothing even close to that past episode happened again. One exciting moment occurred while scanning. I heard engine noise, and suddenly appearing over a rise, I saw a plane tree hopping. Quickly I picked up the plane, but had a hard time keeping it in sight since it was relatively close. It was too close for me to see the entire plane through my glasses, but for a moment I saw the tail, then I saw the nose, and then I saw the pilot. I identified the plane as a P-51 Mustang. The plane had a brightly painted red nose, and it was gone in seconds over the next hill. I made a report to my superior about the incident. On June 6, 1944, the Allied troops had established a beachhead in Normandy. It wasn't until August 1944 that we heard about the invasion. Now we knew the reason for the bombing pause over Vienna. They needed the planes somewhere else. Nestled within the Drava River valley, our battery had a beautiful view of the surrounding gentle hills. The Drava was a wide river and flowed quite swiftly. Our battery had no fence for security, just a few little specks of guns and barracks surrounded by farmland. The river was only a minute or so away. One early fall evening, six of us helpers ventured to the river. It was one of those quiet times, the world appeared to be very peaceful. Forgotten was the war for a moment. We sat on the river bank and tossed pebbles or skipped flat rocks on its surface. On the other bank, we could see an apple orchard, with inviting apples. We noticed a man in working clothes walking through the orchard. He appeared to be just looking at his beautiful trees, loaded with an abundance of reddish-yellow apples. When he looked in our direction, he noticed us. He appeared to communicate by holding up his arm and then pointing to us. He then picked an apple from the tree and walked up to the riverbank. From there, he attempted to toss the apple across the river. When we applauded his actions although his throw was just a little short of reaching us, he motioned, what we interpreted to mean, "come on over and help yourself." It was evening, the sun was about to set, not a time we normally had an alert. Two of our best swimmers, which excluded me, needed little coaxing to cross the river and bring back a few apples. In discussing how they could hang on to a number of apples, we suggested stowing the apples in their shirt, after making sure the belt was very tight. They both crossed the river effortlessly. The stranger appeared to be amused and when he pointed to the trees and to our two fellows. They started to pick apples, stuffing them into their shirts. After thanking the stranger and shaking his hand, our two comrades started their return venture. Halfway across, one of them appeared to have a problem and he called out for help. He was unable to make any headway. The other boy quickly swam over to the boy in trouble, while my friend Joachim jumped in to help. With the apples in the shirt acting as a flotation device, the three then jointly arrived back on our side. We waved goodbye to the man on the other side who smilingly waved back. Not long after this apple caper, we received important information about our high school classes. For me it was the best news I had in a long time.